I'm officially more up to date with my reviews than you guys now, clearly you're doing something wrong! AJ, that post was epic. I generally skim through when someone updates that quantity of games, but they were all succinct yet informative enough that I read through them all. Helps that I either already like or have interest in most of the games there, too. Solid taste, solid writing. alienjesus wrote: I'm officially more up to date with my reviews than you guys now, clearly you're doing something wrong! I kid, I kid. That was excellent. And I loathe Mega Man 8. So this game snuck up on me; I didn't even realize it was coming out until I saw a Polygon interview with the dev team about the changes they made between the first game and this one. For the most part, the changes are in the pacing of teaching you abilities and a handful of new chicken abilities, making it a much more interesting form (rather than a glorified morph ball like it was before). Guacamelee! 2 is definitely one of those "more of the same" sequels, which certainly isn't a bad thing. I'd also say that the challenges top out at a harder difficulty than the first game (but they're also optional), so that's the big draw for people looking for something new. The game starts at the last boss of the first game (though you're hilariously powered up and he's hilariously powered down; it's for story purposes) to quickly introduce you to the setting. This is important, as you are introduced to the idea that there are a bunch of parallel timelines, and you happen to be the only Juan who won in his timeline. The new bad guy is from the "Darkest Timeline", where after your character died a new luchador took up the mask and beat the final boss. However, this is not without consequence, and now this new hero, Salvador, is dying, and is willing to go to any length to prevent that. And that includes tampering with divine forces that threaten the entire multiverse with destruction. So you have to go to the "Darkest Timeline" to stop him. The gameplay is still the metroidvania with the mobility moves also being combat moves, with color coded enemy shields that correspond to each of your moves. There is now a skill tree, which lets you buff yourself over time (and you'll finish the whole thing by the end of the game, so the important thing is to take the skills that appeal to you early). The game supports four player co-op, though I can't imagine how that will go given the precise platforming and timing with the live/dead dimension hopping. It's fast and furious and keeps you on your toes throughout the game. The optional challenges for the best ending are a post-doctoral study in your movement options, and frankly they are far too frustrating for my tastes. You have to do an obstacle course in a single go and it is LONG and requires very precise timing for each of them. If you can make it through all four you get some kind of good ending (I haven't looked it up on the youtubes yet), but unlike Guacamelee! 1 this game's "bad" ending is still quite good. So I'm guessing the good ending is even more good. My list isn't as impressive as some people's, but I have my fair share. I've always had an affinity for those games released during the initial second and third generation overlap. This is when we began to see games evolve significantly in terms of mechanics and aesthetics, but most still stuck to that classic looping high score chaser design. 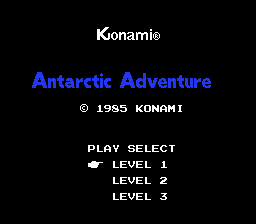 One such title released during this era (1984) was Konami's Antarctic Adventure. 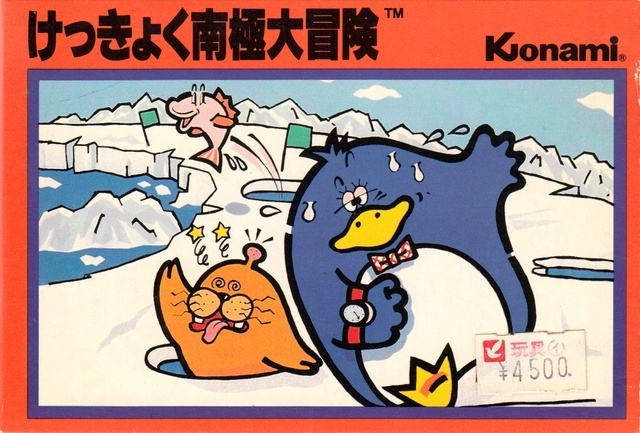 Originally on the MSX, it was soon ported to the ColecoVision (in North America) and Famicom (in Japan). These days, the Famicom port is likely the cheapest and easiest to track down, regardless of what continent you inhabit. As an aside, YouTube comments inform me that every European played this on pirate multicarts back in the day. The goal is to guide a cute penguin named Penta around the perimeter of Antarctica. Each stage concludes with our feathered friend raising a nation's flag at an ice station. The game ends (well, loops) when the flag of Japan ascends, naturally. The viewpoint presented here is similar to that of Sega's classic Turbo, with the player's vantage point situated behind Penta. It's a race against the clock, and instead of other "drivers" on each course Penta must instead hop over and steer clear of various chasms and dastardly seals. Controls are solid. The up button is used to gain acceleration, and there's little reason to ever not travel at the top speed. Penta jumps gracefully, and if he's travelling fast enough multiple pitfalls can be cleared with a single bound. Note that Penta isn't your typical video game hero -- falling in a hole does not spell certain doom, but it does certainly slow him down. There are actually a variety of chasms, some merely trip up Penta a bit while others result in some more serious stalling. Then there are the seals -- these really cause issues, occasionally popping out of holes about a millisecond before Penta can clear them. For this reason I recommend going around obstacles whenever possible. Each stage is littered with items in the forms of flags and fish that leap up from the depths. Most do nothing but divvy out good ol' points, but the flashing flags defy the laws of zoology, allowing Penta to fly for a spell. These are all but required in the final stage on the standard difficulty, and are necessary to clear multiple stages on the game's hardest mode. Graphics are serviceable. 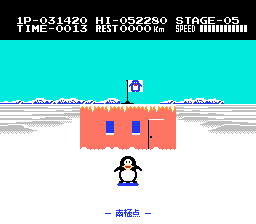 Antarctic Adventure certainly looks like an early Famicom game; in fact it looks about identical to its ColecoVision brethren. A sea of stark white dominates the screen (hey, it is Antarctica) though Konami was kind enough to experiment with varying sky colors. It's as if the sun is setting upon Penta as he traverses the stark landscape. Penta's animated well and strikes an adorable pose upon level completion. The game's main theme is undeniably catchy though also unoriginal -- it's instantly recognizable as being an 8-bit rendition of Émile Waldteufel's The Skater's Waltz. 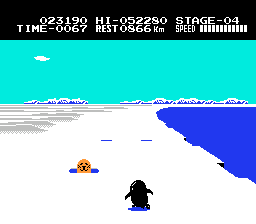 Ultimately, Antarctic Adventure is a tasty morsel of retro gaming fun. The game's goals and control scheme are immediately clear, even to someone just picking up the cartridge for the first time. The frustration factor can be a bit high at first (again, go around the holes) but after a bit of practice everything felt second nature; and there's no better way to kill an afternoon than with a playthrough of something like Antarctic Adventure. It's great for kids too, if my four-year-old's approval is any evidence. She swears Penta is wearing roller skates. I don't see it. Last edited by ElvinStrawhat on Wed Sep 12, 2018 9:41 am, edited 1 time in total. 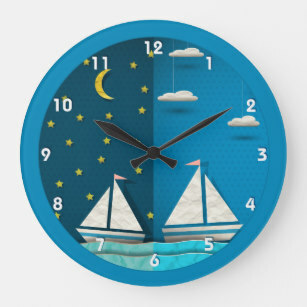 I'm curious what you thought of these two! I really like DDA, probably my favorite DD game, and I've had my eye on The Mummy Demastered for a while, certainly looks good.